When you’re running a business, you need to ensure the safety and comfort of your customers when they’re on your property. Your parking lot is the first impression on your potential customers when they drive into your property. A good, well maintained one might go unnoticed, but a badly maintained one immediately grabs attention. In this case, negative attention is definitely not welcome. Striping is an important aspect in your parking lot and it’s not something you should ignore. Faded or non-existent striping can cause your customers problems. Here are some reasons why you should add striping to the lot. Bright and clear striping makes your parking lot look very sharp and clean. It’ll leave an impression on your customers, especially if it eases their experience. Clearly marked lines and signs can enhance the overall look of the lot and that impression would extend to your business. Faded striping can be risky for drivers as well as pedestrians. If the lines are hard to see, your customers might not be able to park properly or head in the right direction. This can lead to problems. By adding fresh striping, you’re making the lot safe to use. If the parking spots are clearly designated, most of your customers would park in those areas carefully. If they’re not, people will park however they wish and that can reduce the space available. With clear striping, you can maximum the space and accommodate more customers. If you have clearly marked ADA compliant signage for such customers, you’ll be able to ensure they aren’t inconvenienced in any way. You can ask a professional about the different signs that you’ll need to paint. If any accidents occur due to faulty striping on your property, you’ll be considered responsible for it. Accidents are a possibility if the lines aren’t clear and your customers have to strain to see them. The best way to avoid liability is to make sure that the paint and all the signs are very clear. The parking lot is a part of your customer service. It’s a way to ensure that customers don’t have to go hunting for parking space. If you keep the striping in your lot up-to-date, your customers would appreciate it. 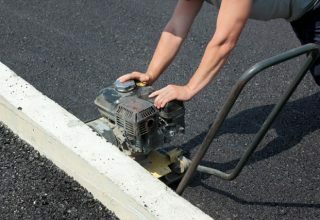 Keeping the area clear and the striping fresh on your parking lot doesn’t cost much but it provides plenty of benefits.